Towards the end of January, we spent a wonderful weekend up in Prince Edward County at the Devonshire. Its a dreamy spot for a weekend away, and we took full advantage of the hotel slippers and bathrobes, self-serve coffee, the games room, and multiple fire places. We ate both our dinners at new local spots (here and here), but enjoyed breakfast at the hotel while soaking up the beautiful lake view from their dining room. 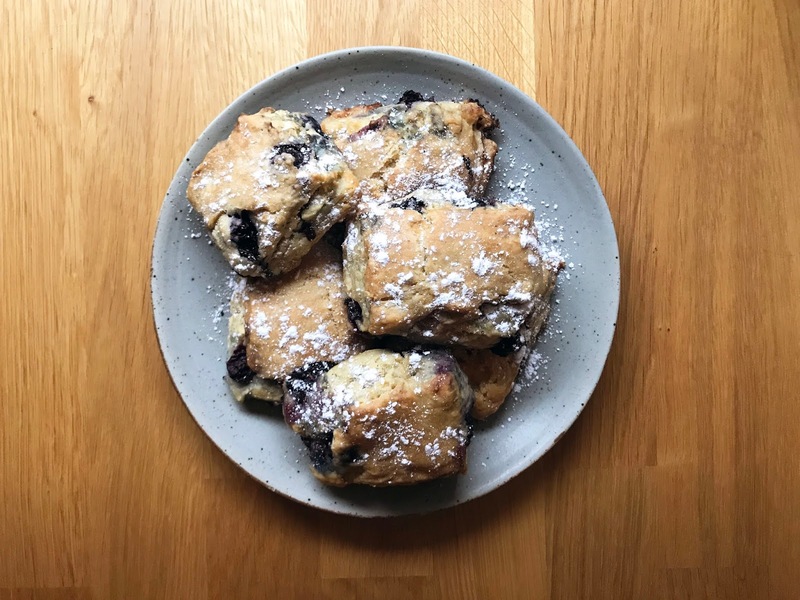 Though we didn't order the blueberry scones, I've been dreaming of them since. A quiet weekend at home seemed like the perfect time to use up the last of the freezer blueberries and try a new scone recipe. A few years back (2015), I got really into the idea of Christmas cookies. I scoured the web and settled on a few favourites. 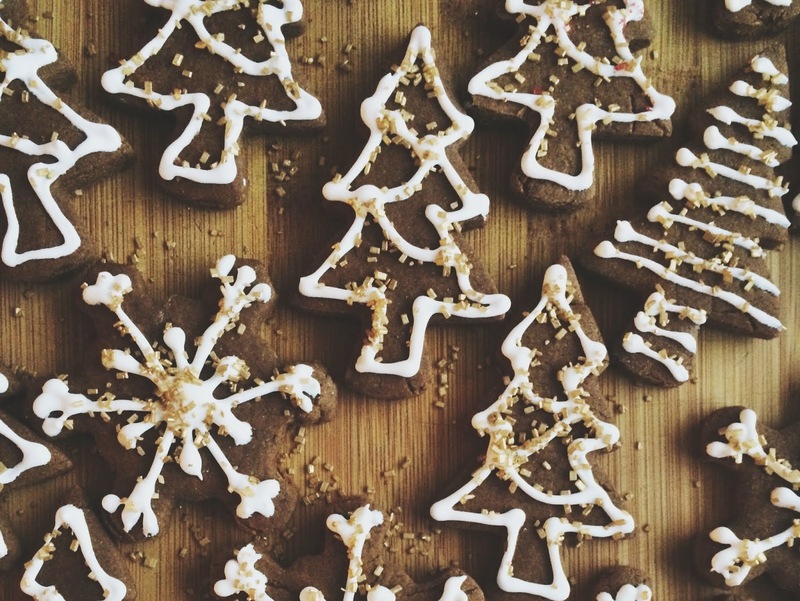 Since then, these gingerbread have become an annual treat in our house come December. There's something so comforting about the ginger + molasses combo, and something so relaxing about piping/decorating with royal icing and sprinkles. I figured it was finally time for my version of these cookies to live on the site. Happy Holidays! 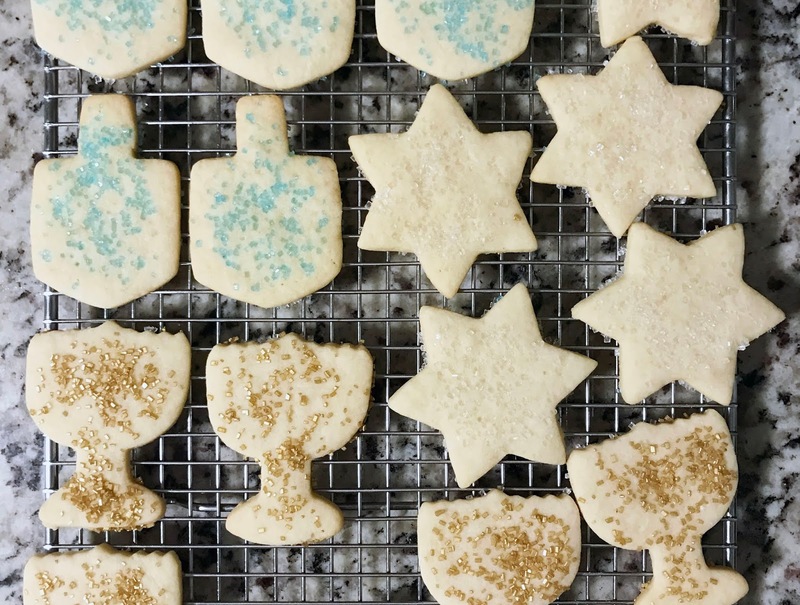 Chanukah came and went this year in a whirlwind of eight crazy nights. We hosted a little Chanukah party for our nieces where we played dreidel, decorated cookies (recipe below) and ate copious amounts of latkes; we hosted friends on night two for fried chicken and donuts; we missed one night to watch a leafs hockey game; missed another night for N's office holiday party; and spent the last two nights in Montreal en famille. My new festive cookie cutters were put to good use, as was the giant bag of russet potatoes that we bought. All in all, it was a great eight days. Happy Thanksgiving! This time last year, we were one week away from our wedding, hanging in the Eastern Townships with my family. I attempted my first pumpkin pie last year, and it turned out so well, that I was put in charge of dessert again this year. I relied heavily on my Oma's fool-proof shortbread tart crust, and adapted a basic filling recipe to my dairy-free needs. Simple and delicious. I hope you like it. Make the tea. Boil water in a large pot. Add sugar, and whisk to dissolve. Add tea bags, cover, and let steep overnight (or over the course of the day). Once cooled completely, remove the tea bags. First fermentation. In a large glass vessel, combine your steeped tea and starter kombucha. This can be either store-bought kombucha, or the liquid you've stored your scoby in. With clean hands, transfer the scoby into the jar. Cover jar with a dishcloth, seal with an elastic band, and set aside for the first round of fermentation (7-10 days, depending on how warm your house is). Bottling and second fermentation. After 7-10 days, using clean hands, gently remove the scoby. You can either use it immediately in another batch of kombucha, or store it in the fridge, in a small glass jar with enough kombucha liquid to keep it covered. 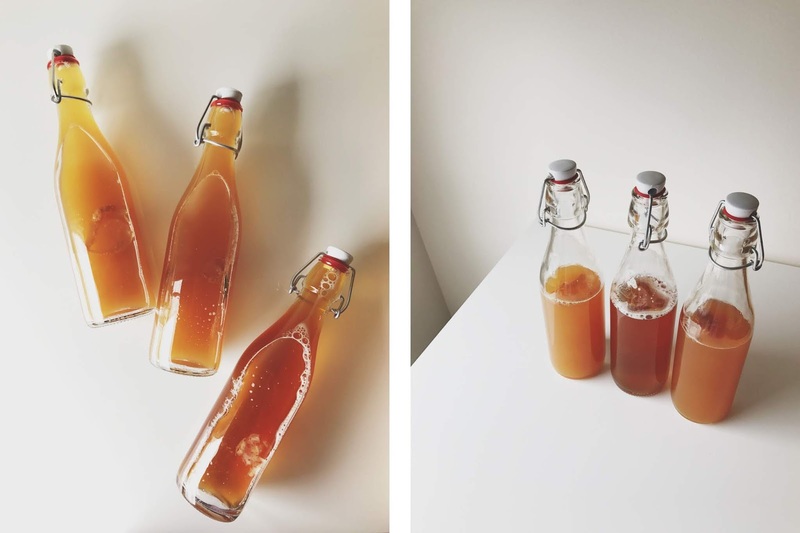 Transfer your kombucha into smaller bottles, and add any second fermentation add-ins (see below). Seal the bottles, and set them aside for the second round of fermentation (3 days). After 3 days, move the bottles to the fridge and enjoy! Blend on a high speed a 4" piece of ginger, 1/2 cup water and 1 Tbsp maple syrup. Strain through a fine mesh sieve. Split evenly between the bottles. add 1-2 Tbsp ready made cherry juice to each bottle; alternatively, blend pitted cherries and a bit of water on high speed. Strain through a fine mesh sieve before adding to bottles. Two years ago, post licensing exams, two girlfriends and I got together to cook the #foodofourpeoples. We started with gnocchi, then followed a few months later with pesto. We soon realized that after spending a day in the kitchen, it was way more fun to include more people, and wine, when feasting on the fruits of our labour. So just like that, the #foodofourpeoples dinner parties were born. First up was a Portuguese feast, featuring family wine, Portuguese stew and custard tarts. Then we devoured an Italian meal, filled with cured meats, tortellini, veal cutlets and panettone. And finally, last night, we hosted an Israeli themed dinner, inspired by some of my favourite local middle eastern restaurants (here and here). My favourite kind of evening is a low key night at home with friends, with good food and good wine. 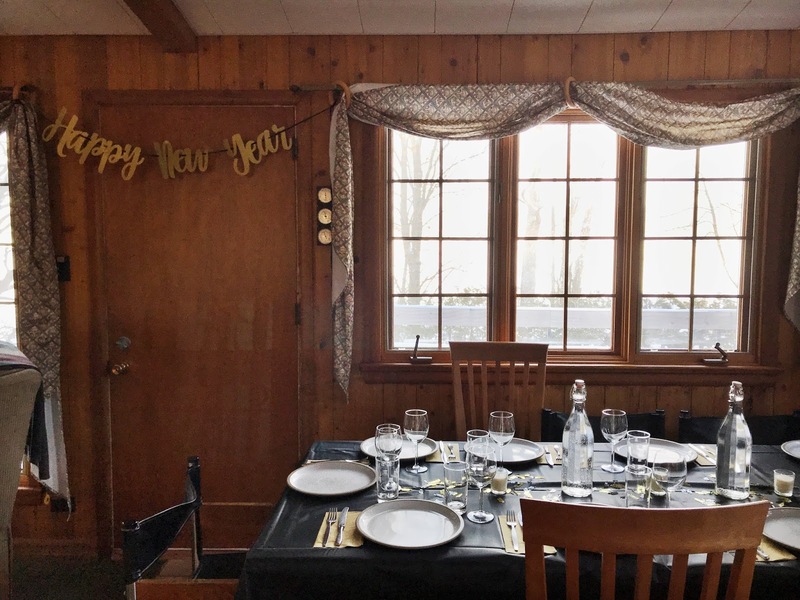 Toss in a roaring cottage fire, boardgames and festive decorations, and I am one happy camper. With a little bit of prep, a Sunday roast comes together effortlessly, and easily feeds a crowd. Combine that with a handful of simple sides, and no one will go home hungry. Here's a breakdown of how we tackled our new year's eve Sunday Roast. Happy 2018!